There is a certain achievement or milestone available for each eBirder that is a great contribution toward citizen science and a source of personal pride: Having a complete annual bar chart for your personal location(s). This means that for your chosen birding haunt you have submitted at least one report for each week of the year. Well, today I finally achieved that for Avimor, the foothills community in which I live! 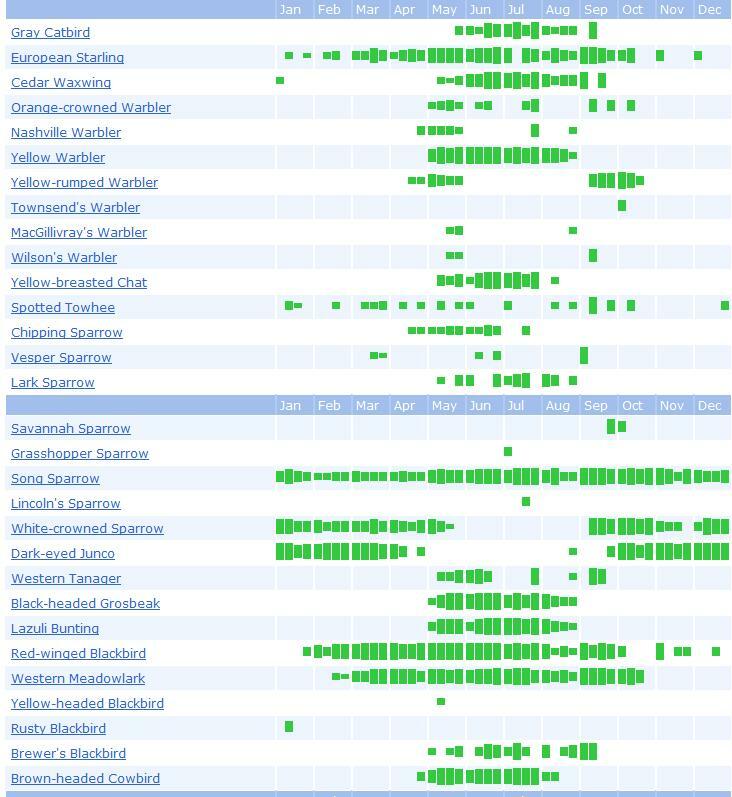 Small sample of the Avimor eBird Bar Chart - this gives me, other birders, and scientists a good understanding of the comings and goings of birds in my community. Migration patterns are understandable at a glance. An eBirder knows he/she has a complete annual bar chart because weeks without a checklist are shown with a frustrating, albeit motivating, gray-hatching. That gray line all the way down your chart glaringly points out that you have more work to do. It brings me a lot of satisfaction to have no gray weeks in my Avimor Bar Chart! My Avimor bar chart is made of up reports from 16 specific eBird locations within the Avimor property. Each location has its own unique characteristics, be it habitat or geography, that I want to track separately. Based on the sample size, available by downloading the histogram data, I see that I still need to work on my reporting consistency in the last six months of the year. My data will just get more and more accurate and useful as I continue to report my community sightings to eBird. 2. Long-Eared Owl - hard to find, but I had them nest here! 3. Northern Shrike - prep'ing for my Big Sit! last year.